Catherine and Louis Poitout overlooking their vines in Chablis. Chablis is located in northern Burgundy, producing wines of gunflint smokiness and finesse, a signature of its chalky Kimmeridgian soils. Chardonnay struggles to ripen in its cold terroir of limestone clay with flavors no region in the world can reproduce. Quite different than the rest of Burgundy down south, Chablis is firm but not harsh, reminiscent of stones and minerality. Chablis can produce some of the most electrifying Chardonnay in the world; full of character and terroir and in recent years has gained popularity with collectors and enthusiasts alike. Demand for grand cru Chablis has hit an all time high, a trend that transformed Burgundy into a luxury good. But there are new comers like Louis and Catherine Poitout, both from old Chablisien families, who are producing Chablis of incredible expression and value. Their small plots in Chablis are produced naturally and honestly. 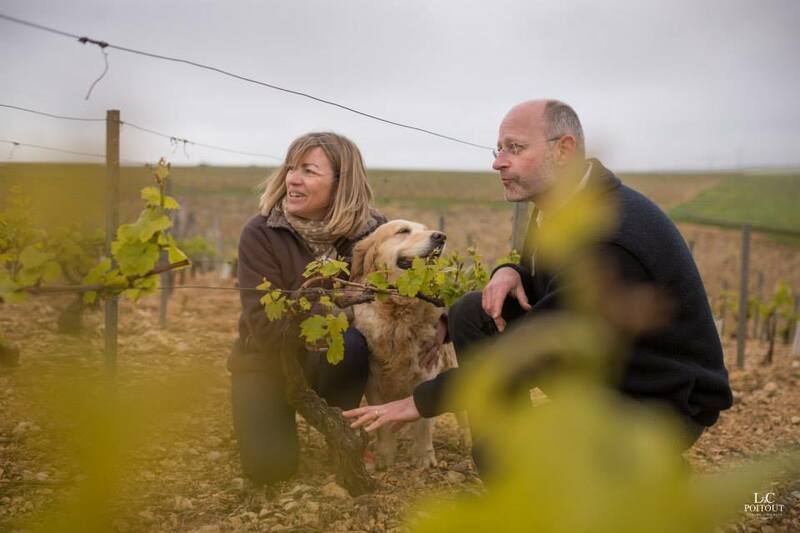 Louis and Catherine believe in showcasing what each vineyard can offer, so they focus on their parcels and don’t do any assemblage. Together they own plots in Chablis, Lignorelles, Maligny and Villy but most interestingly they own a tiny 0.5 hectare plot of ungrafted centenary vines in Petit Chablis. But how could this plot survive the wrath of the phylloxera plague of the late 19th century? It turns out the soils are clay based which retains enough water in the winter making it inhabitable to the phylloxera pest, so the vines remained unharmed and thriving for decades. These exceedingly rare vines are just one of the handful of vineyards they own. With holdings in Fourneaux and Vaucoupin, discover this electrifying winemaking duo one vineyard plot at a time!